In the song “Radio Nowhere,” Springsteen sings, “This is radio nowhere, is there anybody alive out there?” In her presentation “Getting Students Amped on Projects,” Humanities teacher Ashley Degrano shared her strategies for increasing student engagement and building student interest in Project Based Learning. Her presentation provides a loud, resounding answer of yes to The Boss’ question. 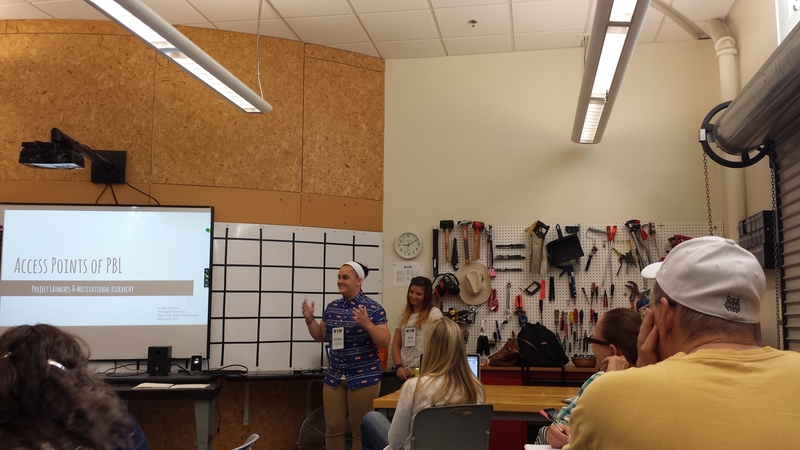 She shared with us her strategies for generating excitement and engagement from day-one of a project based learning experience. Tools in an academic classroom? Why not! Ashley’s unit, “Airwaves of Identity” is impressive. Students tied together the themes of the novel Divergent, skilled reflection writing and community engagement to ultimately stage a series of “live radio shows.” Each show grappled with the Essential Questions: How much impact does our outside environment have on the choices we make? How much impact do we have in influencing others through voice and actions? 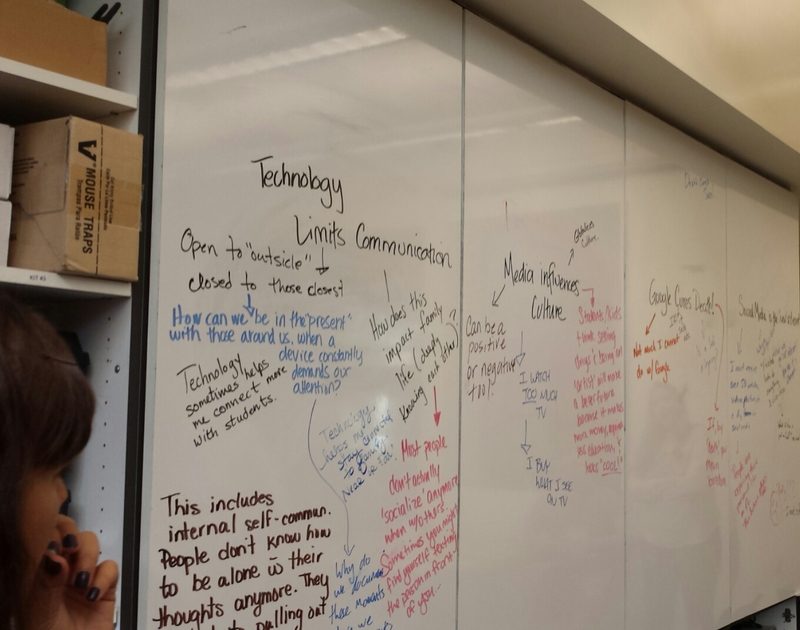 The way a Chalk Talk works is for nearly 10 minutes students go up to the board and quietly, without any discussion or prompting, write or draw whatever comes to mind in relation to the topics. Concept maps naturally emerge around each topic. There is no order to who goes up when or limit to the number of times a person can contribute. At the end of the 10 minutes everyone silently identifies the contribution that is most interesting to them. Then everyone grabs a partner and has a short discussion. Our Chalk Talk concept maps. The discussions we had at the end of our Chalk Talk were very lively and Ashley says its the same with students. She told us that she does this activity before giving out the assignment details. The Chalk Talk establishes thinking first rather than project directions and details. This way, it is not about following directions or doing what they are told to do, rather about continuing exploration of ideas. Nearly every HTH teacher I’ve spoken to places great emphasis on process and meta-cognition. One way to have students reflect on process is to have them take turns in the role of Student Documentarian. For each project Ashley assigns one student this role. The student completes a slightly modified version of the project but spends most of his or her time recording classmates at work. Each week the documentarian has to interview two different peers, capture the mood and progress of the groups and reflect on what they shot. Ultimately, the documentarian edits and packages his or her work. These documentaries can then be posted online and shared or simply become part of the class’ portfolio of work. Ashley told us it is a great role for a student who doesn’t want to work in groups. For these reluctant students they believe the role will allow them to remain relatively isolated, but the great thing is, it actually forces them into quality interactions with the rest of the class and to build relationships. With these strategies in play, students are engaged at a high-level from the offset, are focused on process not product and get to work in a group that is in part, outside of their comfort zone. From the work Ashley shared with us, these practices set students on the path to passionately and articulately broadcasting their deeper learning. LOVE these strategies. Thanks for sharing! Just saw this! How awesome. Thanks for enjoying and highlighting a little of what I talked about. I would love to touch base soon and see how things are going!